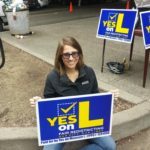 Following a hard-fought campaign, Sacramento’s Measure L passed in November of 2016. Measure L established a 13-member independent redistricting commission to draw city council district boundaries. The commission is fully independent, and has the full and final authority to pass district lines–meaning that elected officials don’t get to choose their own voters any longer. If you think your city or county could benefit from an independent redistricting commission, check out our local redistricting ordinance generator.